The Funeral Service for the late Dr Donald Alexander Hancock of Dunsborough will be held in the Bantry Chapel, Busselton Funeral Centre, 105 Bussell Hwy, BUSSELTON commencing at 11.00am MONDAY (08.04.2019). Following refreshments the Cortege will proceed to the M ARGARET RIVER Cemetery. Loved husband of Patricia. 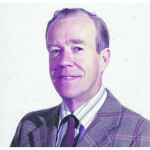 Father of Lynn, Duncan and Andrew, father-in-law of Mary. Grandfather of Krystina, Jonah, Sean, Elias, Levi, Matty, Denham and Ruby. Great grandfather of Billie and Mia. 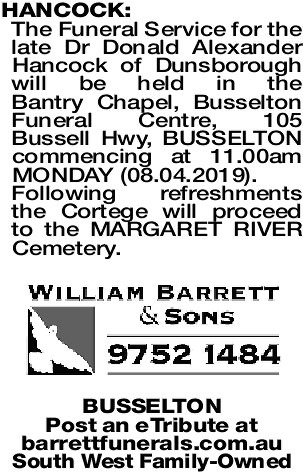 A true gentleman, father and husband committed to his family and the work that he loved, a faithful servant gone to be with the Lord. Thank you for being in our lives and thank you for the love you gave us all. The love of my life, I cherish the 65 years together. I will always love and miss you, until we meet again. Dear Dad, love you forever, I will miss you so much. A better and kinder man there could never be. I love you until we meet again. 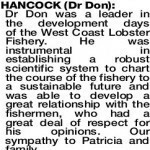 HANCOCK DR DON Dr Don was a leader in the development days of the West Coast Lobster Fishery. 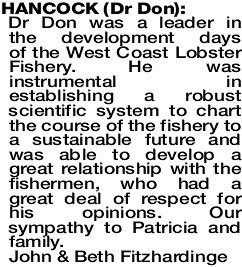 He was instrumental in establishing a robust scientific system to chart the course of the fishery to a sustainable future and was able to develop a great relationship with the fishermen, who had a great deal of respect for his opinions. Our sympathy to Patricia and family. 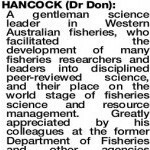 HANCOCK DR DON A gentleman science leader in Western Australian fisheries, who facilitated the development of many fisheries researchers and leaders into disciplined peer-reviewed science, and their place on the world stage of fisheries science and resource management. 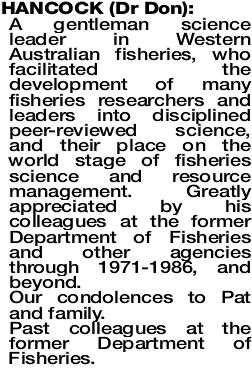 Greatly appreciated by his colleagues at the former Department of Fisheries and other agencies through 1971-1986, and beyond. Our condolences to Pat and family. Past colleagues at the former Department of Fisheries.